I have always been careful about what I use on my skin. Products that contain oil or excess chemicals make me break out. 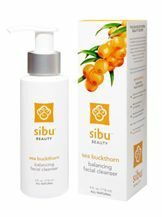 Sibu Beauty’s Sea Buckthorn balancing facial cleanser removes my excess oil and leaves my skin looking and feeling great. All Sibu Beauty products contain extract from the tiny sea buckthorn berry. This little berry grows in the harsh conditions and high altitude of the Tibetan Himalayas. It is fortified with over 190 bioactive compounds, including omega-7 fatty acids. Omega-7 fatty acids are found in animal and plant sources, including macadamia nuts, cold-water fish and sea buckthorn berries. Sea buckthorn contains a much higher concentration of this valuable fatty acid, up to 40% as compared to 17% in macadamia nuts. While this omega has numerous skin and health benefits, it is also known for its ability to support a healthy weight, cardiovascular health, and gastro-intestinal health. Skin, hair and nails Omega 7 provides key building blocks for skin, hair and nails. It helps combat wrinkles, dryness, loss of skin elasticity, and other symptoms of malnourished or aging skin. It also helps skin function properly by supporting collagen production, protecting against oxidative damage, restoring youthful resilience and plumpness to aging skin cells, rejuvenating skin cell membranes, enhancing the skin’s ability to retain moisture, repairing sun-damaged skin and protecting against sun damage, toxins and environmental stress. The Sea Buckthorn Balancing Facial Cleanser is a non foaming gel that works great for all skin types. It contains micro-particles for a gentle exfoliation and removes make-up with ease. To learn more about the Sea Buckthorn Berry and Sibu Beauty’s full line of products visit sibubeauty.com. One Healthy Moms Magazine reader can win a bottle of Sibu Beauty’s Sea Buckthorn Berry Balancing Facial Cleanser. All you need to do is like Sibu Beauty on Facebook, follow Sibu Beauty on Twitter, follow Sibu Beauty on Pinterest and leave us a comment. This contest is open to US residents 18+ and ends on March 18, 2013 at 8am PST. For every entry including extra entries please leave a separate comment. Winners will be chosen randomly from the comments and e mails that I receive. The contest ends on March 18, 2013 at 8am PST and is open to anyone in the US, 18+. Please leave your e mail address in your comments. All comments without e mail addresses will be disqualified. Are Online Fitness Programs Really Worth your Time, Energy and Money? Liked Sibu Beauty on Facebook: Nicole Sender, following Sibu Beauty on Twitter @minibea & following Sibu Beauty on Pinterest: Nicole Sender. Joined your Blog Frog Community: Nicole Sender. I like Sibu Beauty on Facebook as Margot Core, follow Sibu Beauty on Twitter as @AnnaZed and follow Sibu Beauty on Pinterest as Margot Core.